There’s been disturbingly little coverage of the same scale received in the aftermath of Haiti’s earthquake compared to the disaster unfolding in rural Pakistan right now. Anderson Cooper is not broadcasting 24/7 from Pakistan holding little brown babies in his arms. Diane Sawyer isn’t confronting doctors in the field for failing to treat patients adequately. No doubt, the coverage of the Haitian earthquake was moving, shocking, gripping — and appropriate to the scale of the disaster and the human toll. Yet why is the American mainstream media so unconcerned about Pakistan? It doesn’t make good got-dang sense! Honestly –I’m completely baffled. It’s one of the largest humanitarian crises we’ve seen in recent years likely exacerbated by the impact of global warming on the globe’s weather, but not only that — it’s happening right near the war zone right across the border from where we’re fighting the Taliban and Al Qaeda in Afghanistan. This is a massively important story with global ramifications yet how much do you really know about what’s going on? It’s about 10,000 times more critical than the NYC mosque situation, but frankly I felt I knew much more about that sitch than about what’s going down in Pakistan’s Swat Valley. So I did a little digging around in the international press just to get up to speed. Here’s the short version: it’s bad. America, the Marines and President Obama are on it (however, it’s strange to me that his vacation started without a strong public statement re: our commitment to help the region). The photo below is from Aug 13 and is courtesy of Staff Sgt. 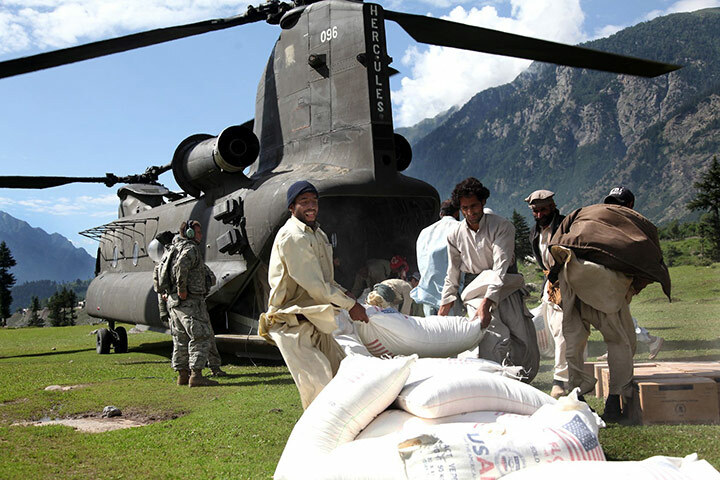 Horace Murray/EPA highlights how America is helping — “Pakistani men unload bags of flour from a US army Chinook helicopter in Khyber Pakhtunkhwa province”. Peep the full photo essay from the U.K.’s Guardian. The United States has pledged $71 million in emergency assistance to the country, which is key in the fight against al-Qaida and the Taliban as well as stabilizing neighboring Afghanistan. 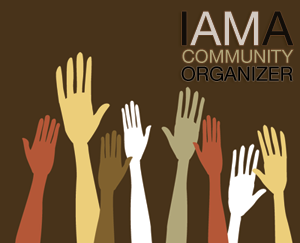 It has also deployed the military to help, as it often does after major disasters. The USS Peleliu arrived off the coast near Karachi on Thursday along with helicopters and about 1,000 Marines. The helicopters will fly to flood-hit areas and rescue stranded people and deliver food and other supplies. Slightly longer download of whassup in Pakistan after the jump (click on the links to get more data). This may be happening far away to people you don’t know — but trust on this — it stands impacts you, me and every American directly. The clip above shows the UN Secretary-General Ban Ki-moon speaking after touring parts of Pakistan that have been devastated by floods Pakistan & breaking it down — how bad it really is. Pakistan’s floods have not just devastated the lives of millions of people, they now present an unparalleled national security challenge for the country, the region and the international community. Lest anyone under-estimate the scale of the disaster, all four of Pakistan’s wars with India combined did not cause such damage. In Khyber Pakhtoonkhwa (KP), formerly the North Western Frontier Province, where both the Pakistani and Afghan Taliban are based, millions of people have lost their homes and are on the move â€“ this just a few months after many of them had returned home after successful military offensives against militants in the Swat valley. Now every single bridge in the Swat valley has been destroyed and the roads washed away. “This disaster is worse than the tsunami, the 2005 Pakistan earthquake and the Haiti earthquake,” Maurizio Giuliano, a spokesman for the UN Office for the Coordination of Humanitarian Affairs (OCHA), said. He said the 13.8 million affected outstripped the more than 3 million hit by the 2005 earthquake, 5 million in the tsunami and the 3 million affected by the Haiti earthquake. The United Nations estimates 1,600 people have died in Pakistan’s floods. About 220,000 were killed by the December 26, 2004 tsunami in Southeast Asia.